The Cosmos The Sumerians regarded the universe as consisting of heaven and earth. The Sumerian term for universe is an-ki, which translates to "heaven-earth." Earth was seen as a flat disk surrounded by a hollow space. This was enclosed by a solid surface which they believed was made of tin. Between earth and heavens was a substance known as lil, which means "air" or "breath." The moon, sun, stars, and planets were also made of lil, but they were also luminescent. Completely surrounding the an-ki was the primeval sea. The sea gave birth to the an-ki, which eventually gave rise to life. The Gods The gods of Sumer were human in form and maintained human traits. They ate, drank, married, and fought amongst each other. Even though the gods were immortal and all-powerful, it was apparent that they could be hurt and even killed. Religion The religion of the ancient Sumerians has left its mark on the entire middle east. Not only are its temples and ziggurats scattered about the region, but the literature, cosmogony and rituals influenced their neighbors to such an extent that we can see echoes of Sumer in the Judeo-Christian-Islamic tradition today. From these ancient temples, and to a greater extent, through cuneiform writings of hymns, myths, lamentations, and incantations, archaeologists and mythographers afford the modern reader a glimpse into the religious world of the Sumerians. Sumerian Cosmology From verses scattered throughout hymns and myths, one can compile a picture of the universe's (anki) creation according to the Sumerians. The primeval sea (abzu) existed before anything else and within that, the heaven (an) and the earth (ki) were formed. The boundary between heaven and earth was a solid (perhaps tin) vault, and the earth was a flat disk. Within the vault lay the gas-like 'lil', or atmosphere, the brighter portions therein formed the stars, planets, sun, and moon. The Each of the four major Sumerian deities is associated with one of these regions. 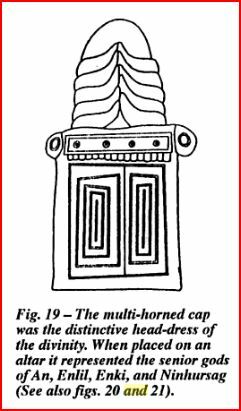 An, god of heaven, may have been the main god of the pantheon prior to 2500 BC., although his importance gradually waned. (Kramer 1963 p. 118) Ki is likely to be the original name of the earth goddess, whose name more often appears as Ninhursag (queen of the mountains), Ninmah (the exalted lady), or Nintu (the lady who gave birth). It seems likely that these two were the progenitors of most of the gods. Nammu Nammu is the Goddess of the watery abyss, the primeval sea. She may be the earliest of deities within Sumerian cosmology as she gave birth to heaven and earth. (Kramer 1961 p. 39) She is elsewhere described both as the mother of all the gods and as the wife of An. She is Enki's mother. She prompts him to create servants for the gods and is then directed by him on how, with the help of Nimmah/Ninhursag to create man. The Primary Deities It is notable that the Sumerians themselves may not have grouped these four as a set and that the grouping has been made because of the observations of Sumerologists. The Seven Who Decreed Fate In addition to the four primary deities, there were hundreds of others. A group of seven "decreed the fates" - these probably included the first four, as well as Nanna, his son Utu, the sun god and a god of justice, and Nanna's daughter Inanna, goddess of love and war. The Annuna (Anunnaki) and others At the next level were fifty "great gods", possibly the same as the Annuna, although several gods confined to the underworld are specifically designated Annuna, An's children. The Annuna are also said to live in Dulkug or Du-ku, the "holy mound. In the "Descent of Inanna to the Nether World" the Anunnaki are identified as the seven judges of the nether world.